WASHINGTON—A. Shuanise Washington, president and chief executive officer of the Congressional Black Caucus Foundation, Incorporated (CBCF), today released the following statement on the passing of actress and civil rights champion, Ruby Dee. 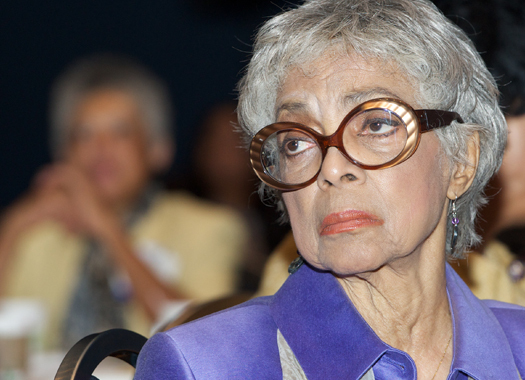 “It is with great sadness to learn of the passing of Oscar-nominated actress, writer, and activist, Ruby Dee. With a career in theater and film spanning seven decades across all forms of media, Dee was simply an icon. Dee helped pave the way in breaking down racial barriers in the entertainment world. “Dee, along with her late husband, actor Ossie Davis, were a dynamic team in the performing arts community. Off stage, they were also strong civil rights advocates, who used their celebrity to help advance social justice for African Americans. “On September 17, 2010, the CBCF celebrated and honored Dee for her public and civic accomplishments at our 40th Annual Legislative Conference (ALC). There, we heard a recording of her late husband’s rousing speech at CBCF’s first-ever ALC in 1971.